Join us for the annual Easter Escapade, an Easter themed run that is perfect for the whole family. 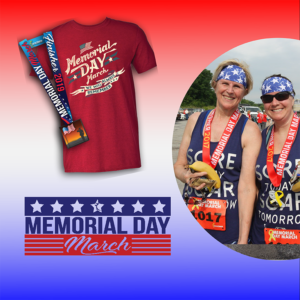 The fun includes great swag (designer shirt, custom medal), chip-timing, live results and awards, free photos, costumes, free kids dash, great post-race food, and plenty of fun activities. Grab your friends and family you are not going to want to miss this one! Seven Bridges Clubhouse, 17800 NW Seven Bridges Rd. Join the Platte County Youth Football League for our 5th Annual Anchors Away 5K. 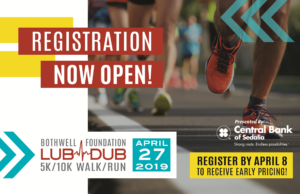 Registration includes entry to walk / run, entry into a raffle for various prize, medals for all finishers, AND a t-shirt. Prizes for top finishers and age group awards will also be given out. Packet pick-up begins at 7:30am race morning! For more details and to register, click here! April is a month to look forward to. Our April WNR is at the Bridges’ home where we get some magical running on the path that Ken marks for us, and then we get the amazing food and company at the Bridges’ home afterward. We're ready to do it again! 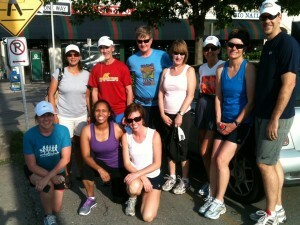 Let's get the Spring running season off to a fast start with the Kansas City Running Club's Interval Training sessions. 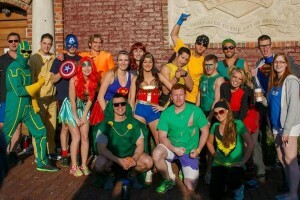 Our world class volunteer & coach, Brett Guemmer, will be leading members through a fun & challenging workout meant to help improve your overall running capacity. This year's interval sessions will be hosted at HyVee Arena in the historic West Bottoms. Come run where it's always 74 degrees and dry! See you there! In honor of Noah and his legacy, Noah's Bandage Project and Agape Montessori School are proud to bring you Noah's Crown Town 5K Run/Walk. 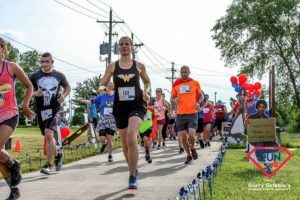 All proceeds, donations of funds, and bandages collected from this race go to support Noah's Bandage Project, and their mission to help fund pediatric cancer research. For more details and to register, click here! The course is run completely on 100% single-track trails in a hardwood forest, with not much elevation gain or loss. This trail is rocky and technical! There are occasional views of Lake Perry, during the race. The Half is one 13.1-mile loop. The marathon is two 13.1-mile loops. The 40-mile course consists of two 20+ mile loops. The 100-Km course is three 20+ mile loops. For more details and to register, click here! Kansas City Police Dept – South Patrol Station, 9701 Marion Park Dr.
To improve and promote the well being of children and youth in South Kansas City through community support and collaboration. Proceeds benefit the Hickman Mills C1 School District, LINC Program, and KC Parks & Recreation Youth Advocacy Fund. For more details and to register, click here! 5k/fun run/1mile walk benefiting Lake Regional Cardiac Rehab. Free Pancake breakfast for all paid participants, $5 for non-participants. 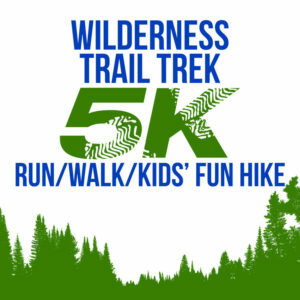 Join us for the Northland Mother's Day 5K/10K! The event will raise money to purchase school supplies for children in need at The Back to School Fair held in August. Designed by Runners for Runners. Certified 5K/10K course at the beautiful English Landing Park in Parkville, MO. Fast course with under 20 ft elevation gain, and with minimal turns. The race can be observed from several locations. For more details and to register, click here! Or follow us on Facebook!